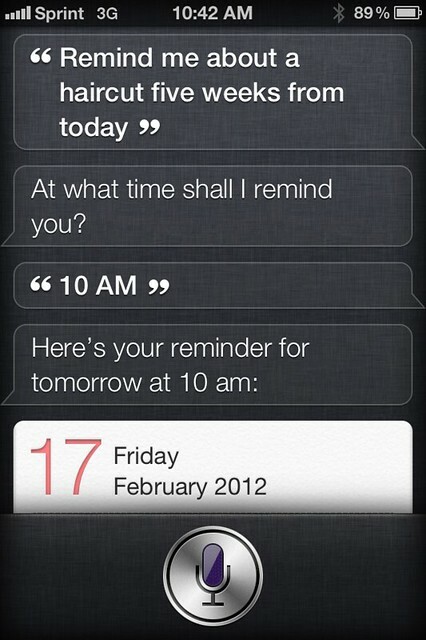 Siri, keeping the "artificial" in "artificial intelligence" - Step 2 is the hard part. Siri, Keeping the "Artificial" in "Artificial Intelligence"
A lot has already been written on Siri, most of it pretty polarized — either of the “it’s a gimmick nobody uses”, or the “wait, but I use it!” variety. I don’t mean to throw fuel on the fire, but I keep trying to use Siri and haven’t found it to work well enough to be worth the effort; here I’ll present some examples which are both edifying and amusing. In the following real-usage examples Siri, while great at understanding what I say (in all these cases the transcribed query is exactly what I meant to say) is not so great at understanding what I mean. 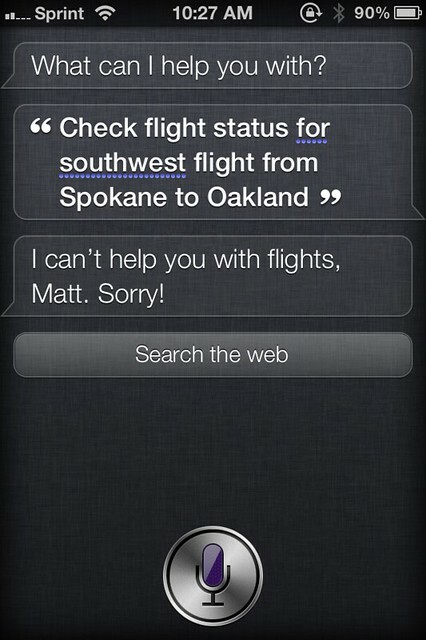 “I can’t help you with flights.” Actually she did understand what I meant, but doesn’t know how to help. That’s too bad; that seems like a really natural function for a personal assistant, and one that lends itself well to machine structured representation and constrained search. 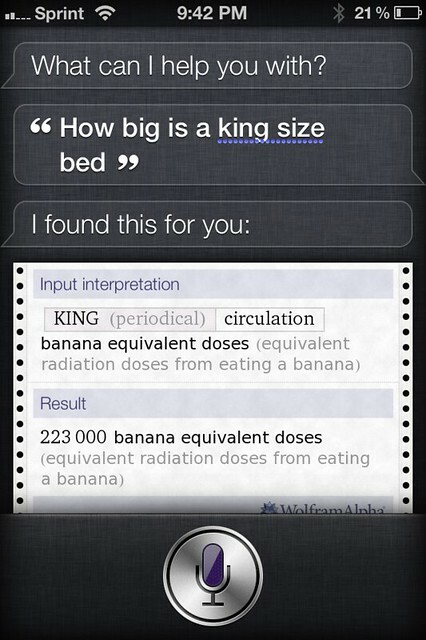 I expected Siri would knock this one out of the park. “3 weeks from today” gets interpreted as “1 week from today”. 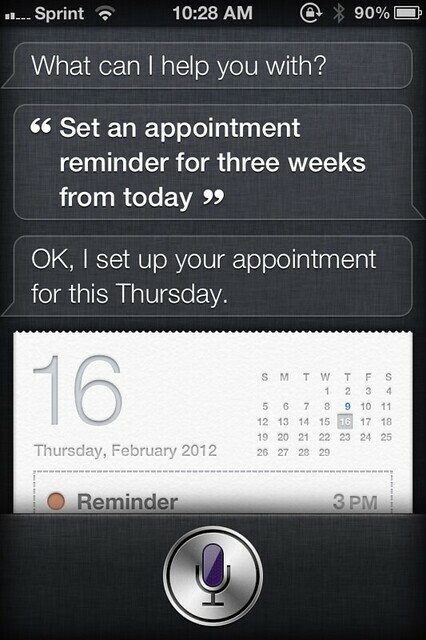 (This screenshot was taken on 2/9, as you can see from the blue marking, and 2/16 where Siri put the appointment is decidedly not 3 weeks later.) Again, Siri is often credited (and advertised) as being good at setting up appointments; I expected her to knock this one out of the park. “5 weeks from today” gets interpreted as “tomorrow”. Otherwise, so close. OK, this wasn’t meant for Siri’s ears at all (it’s not even a question); in fact I thought I was dictating a text message in the Messages app. (Having input focus in the wrong spot is a strange and niggling complaint for a touch platform like iOS, but this is what happens.) 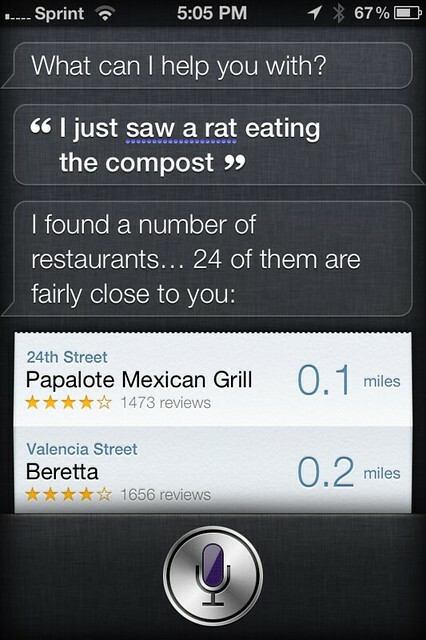 Siri’s interpretation of why I’d be telling her about a rat eating my compost is, however, both noteworthy and disturbing, especially for the establishments it recommends (neither of which deserve this treatment, I can vouch for). On a final note, I’ll reiterate that these are not contrived examples; excluding the compost-eating rat which was a mistake, this list represents the last 4 times I tried to use Siri with real intent, and at least 3 of these are clearly in her domain. With results like these, I don’t know that I’ll keep trying.